T.J. Oshie scored twice in a four-goal second period as the Washington Capitals defeated the visiting Ottawa Senators 7-2 on Tuesday night. This was the first game after the trade deadline for both teams. Washington acquired left wing Carl Hagelin and defenseman Nick Jensen last week while Ottawa traded away three of its top four scorers, including top guy Mark Stone on Monday, in an attempt to rebuild. Ottawa dominated Washington in the early minutes Tuesday and scored the game's first two goals. But it was all Capitals after that. Washington scored twice late in the first period to tie it and added four more in less than eight minutes in the second. Oshie led Washington with those two goals, while Evgeny Kuznetsov, Brett Connolly, Lars Eller and Tom Wilson each finished with one goal and one assist as the Capitals moved into a tie for first with the Islanders in the Metropolitan Division as New York fell to Calgary 3-1 on Tuesday. The Capitals chased starting Senators goaltender Anders Nilsson in the second period after the sixth goal, then scored one more on replacement Craig Anderson. Washington finished with four goals on 17 shots in that second period as the Capitals turned a tie into a four-goal lead heading into the third. 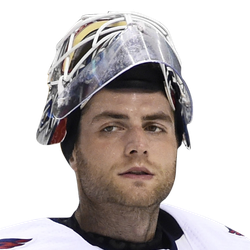 Washington goalie Braden Holtby rebounded after allowing the two early goals to finish with 21 saves. For Ottawa, two of its trades paid off in the early minutes. Oscar Lindberg gave the Senators a 1-0 lead with his fifth goal of the season at the 3:16 mark of the first period, then less than four minutes later, Anthony Duclair scored his 12th. Ottawa acquired Lindberg from the Vegas Golden Knights and got Duclair from the Columbus Blue Jackets. But Wilson finally answered for Washington with his 18th goal of the season with 3:03 left in the period, and Eller tied the score 53 seconds later with his eighth. The Capitals came out firing in the second period and John Carlson gave them the lead on a long blast on the power play 2:38 into the period for his 10th goal of the season. Oshie then put away a rebound nearly four minutes later before Connolly made it 5-2 at 9:05. Then, Oshie got his second of the period -- and 20th of the season -- on an easy tap-in for a 6-2 edge 10:33 into the period. That ended Nilsson's night, and Kuznetsov scored his 17th -- 17 seconds into the third period -- against Anderson.